Where in the world did this week go? Is it really Friday already? I’m not complaining, but holy moly this week flew by. I’m excited for this weekend because Kyle and I are going to play tennis tonight, carve pumpkins and watch Halloween movies tomorrow, and go hiking with the dogs. This is going to be an exciting hike because we’ve never brought both dogs with us. We’ve been working with Grumples for the past year, and we finally think he is ready. If it’s successful, I’ll write a blog all about working with him and not giving up. Dogs can be so hard to train sometimes, but you have to be patient, even if it takes six years. I love leaving my blog with recipes on Friday, but I’m extremely excited about this one. I knew I wanted to make something delicious on Wednesday night, but I wasn’t sure what. I thought about making enchiladas, pizza, or stuffed bell peppers, but I’ve already done those numerous times. I wanted to create something new, seasonal, and filled with fresh produce. Luckily, my boyfriend loves trying different foods and likes pretty much anything I make. I don’t know if he’s just a good sport, but every time I cook something he says “omg, this is the best meal I’ve ever had,” or “this tastes incredible.” Maybe he really does love my cooking? We don’t go out to eat much, so perhaps he really does like it when I cook, and it’s nice to have someone that enjoys the food I make, even when it’s a random recipe I just made up. I was sitting in the parking lot at the Fresh Market brainstorming ideas of what to make for dinner. I had a notepad in my hand to write down ingredients. I started thinking about seasonal foods, and cranberries popped into my head. I grew to love cranberries as I got older. When I was a kid, you couldn’t pay me enough to eat them. I got sick a lot when I was younger, and I’ll never forget forcing myself to drink cranberry juice constantly. Now, you can just give me all the cranberries! 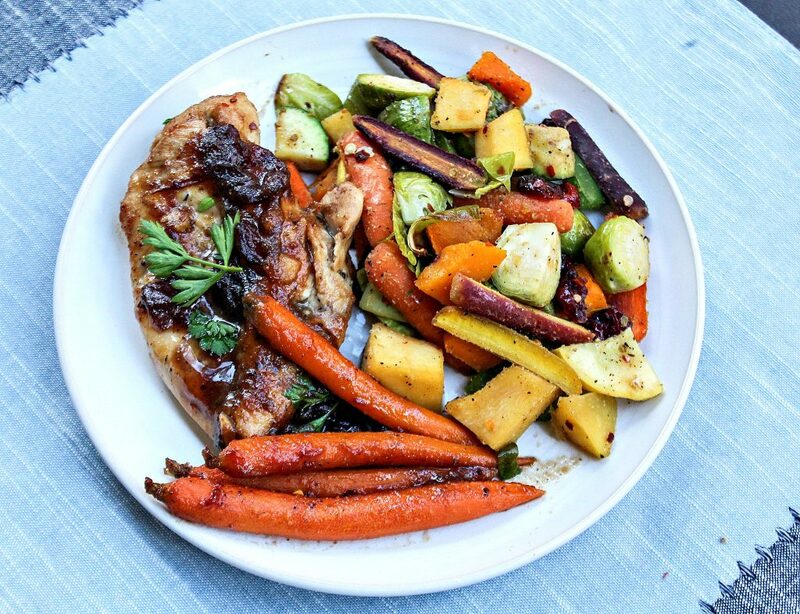 I decided on a cranberry carrot chicken recipe and the perfect roasted Fall vegetables. 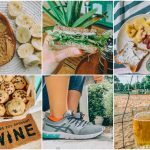 Meals filled with healthy ingredients that you can stuff yourself with is my kind of meal! Now that Thanksgiving is just around the corner, I’ll be posting more recipes for the holiday. 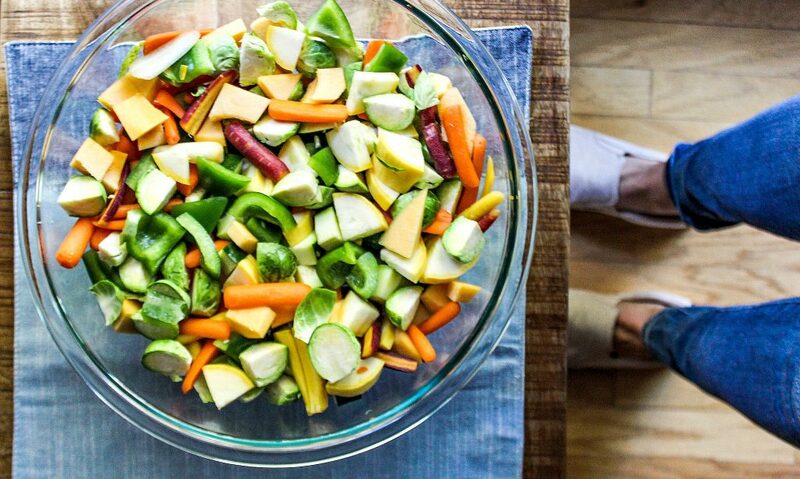 If you’re not sure what to make as a side for Thanksgiving, these vegetables would be a hit. 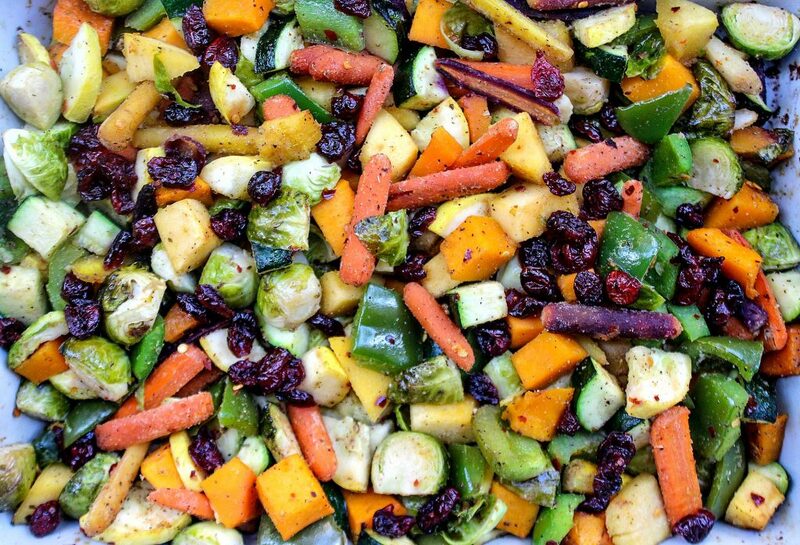 Roasted vegetables are so beautiful, plus they make balancing a healthy lifestyle during the holidays easy! Not to mention, the roasted vegetables can’t really be messed up. Pretty much anyone can make them. Now, where to begin with this chicken? It was sweet, spicy, and savory. It had the perfect amount of flavor, cooked perfectly, and tasted like it was pulled straight from a restaurant stove. It’s filled with a combination of flavors like garlic, ginger, fresh oranges, and more! 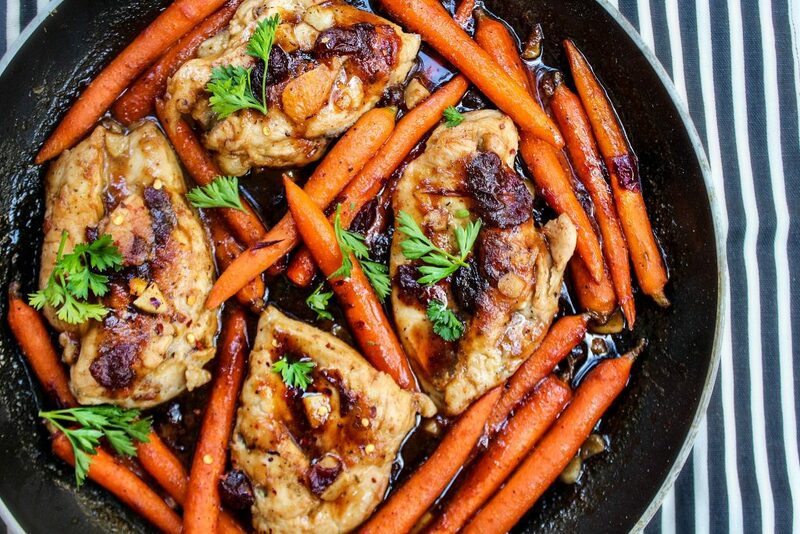 The cranberries glazed the chicken, and it just melts in your mouth. Each bite tasted better and better. Kyle was right, this was probably one of the best recipes I’ve ever made. We ate it again for leftovers last night and we were in heaven all over again. I want to test out this chicken recipe in the crockpot. 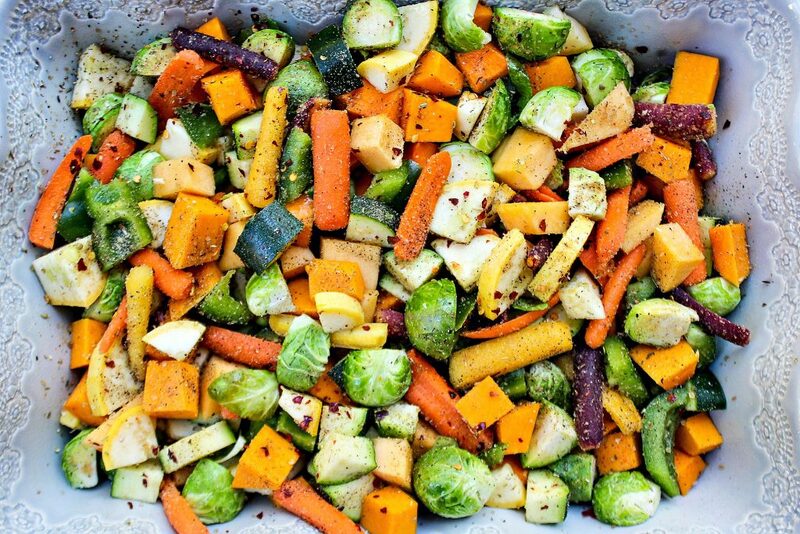 In a large bowl, toss the chopped vegetables in olive oil, and coat them in the seasonings. Bake at 350 degrees, tossing them every twenty minutes or so. Toss the cranberries into the vegetable at the 45-minute mark. Add any additional seasonings if necessary. *I love things with a ton of flavor! Let the vegetables cool & Enjoy! 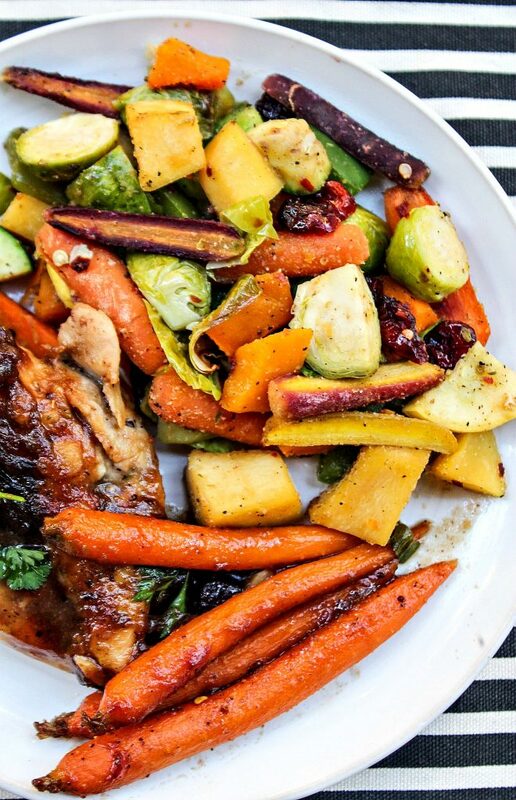 So what makes the roasted vegetables so perfect for fall? Well, the addition of the squash of course! Butternut squash, acorn squash, zucchini, and summer squash all in one 🙂 While I was in the squash section, I picked up an “orangeghetti” squash. Apparently, it’s just like spaghetti squash, so I’m excited to try it out. Have you guys ever had orageghetti? I didn’t even know it was a real thing. You could toss the chopped up vegetables straight into the roasting pan, but I like to do all the tossing in a large bowl. Don’t be afraid to get creative with these. 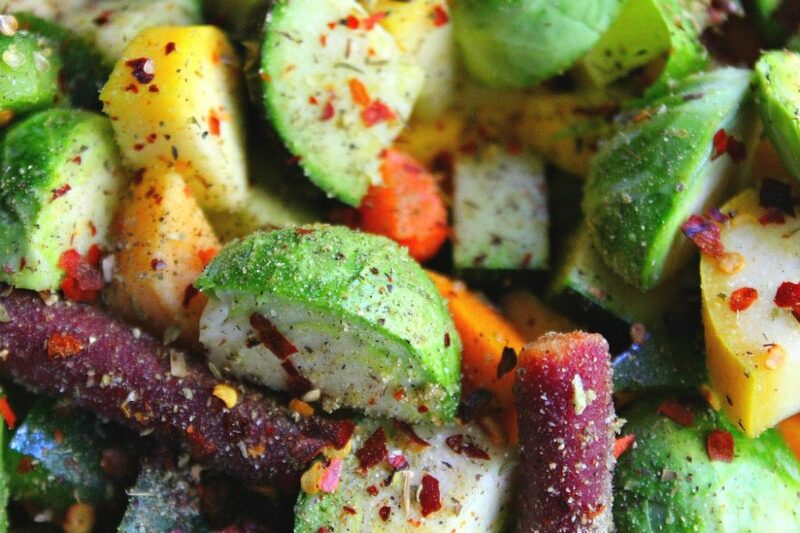 Add any extra vegetables you’d like, or fun seasonings you think would taste good. One year, I did a sweet cinnamon roasted vegetable tray, and it turned out way better than I had imagined. 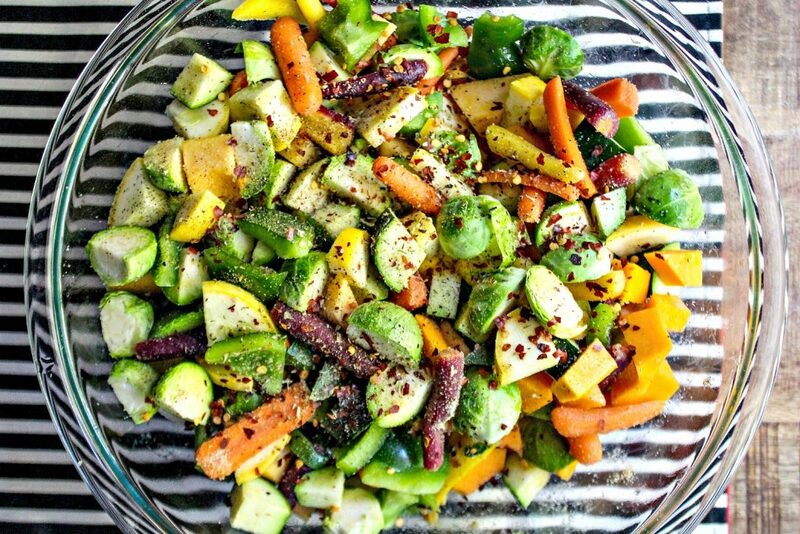 Roasted vegetables are also great for meal prepping. You can add roasted vegetables to your eggs, salads, and all kinds of other dishes throughout the week. Always start with the roasted vegetables first. They’ll take the longest to cook, so while they are cooking away in the oven, you can start with the main dish. How beautiful is that? Oh, and if you’re looking for inexpensive roasting pans, you should definitely check out the Tj-Maxx/Marshalls/Homegoods (assuming most of you already do), but I found this roasting pan for $12.99! I love it! I almost bought one at Macy’s for quadruple the price over the weekend. All ovens cook differently, so just keep an eye on the vegetables. Give them a toss every twenty minutes. Take them out 45 minutes after they’ve been in the oven and add the dried cranberries, or fresh ones. Add any extra seasoning, and put them back in the oven. Sometimes the seasoning weakens the longer and hotter it cooks, so I always end up adding more garlic, onion powder, black pepper, and sea salt. Now that is what I want to see on the Thanksgiving table. 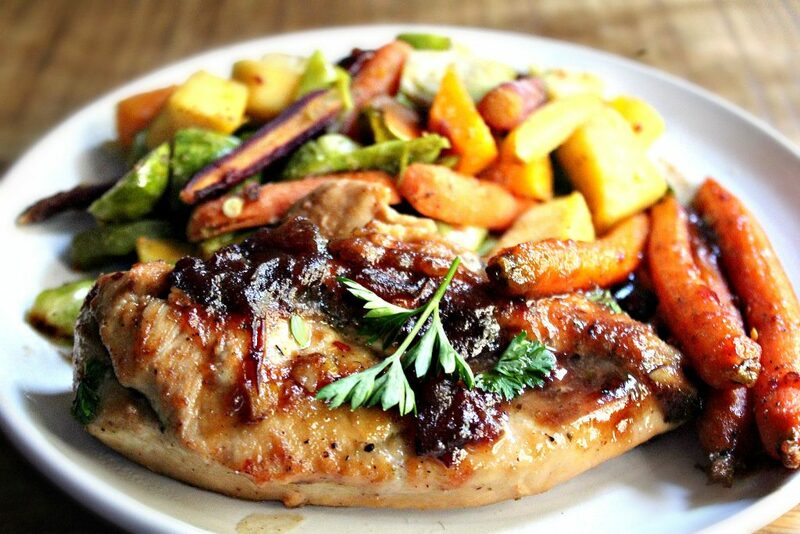 The cranberries give the savory vegetables a nice sweet surprise. 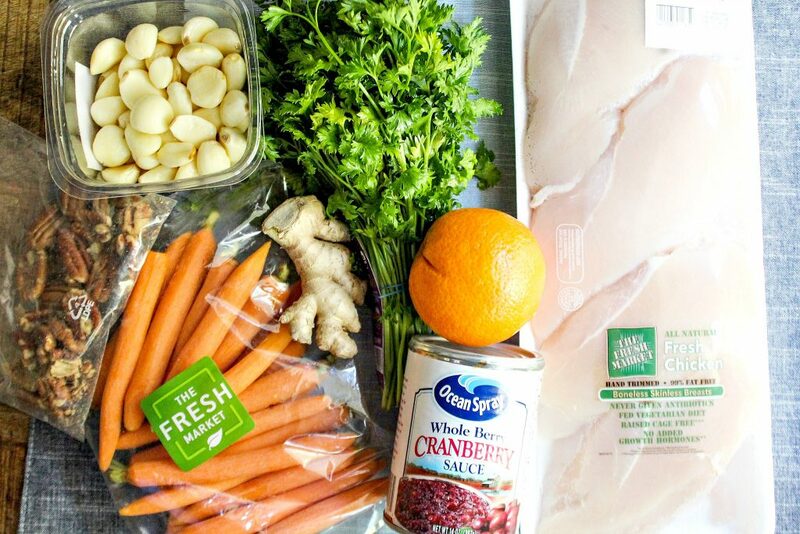 Now, let’s start with the cranberry carrot chicken. This recipe is something you’ll want to try out. It’s unique, and you’ll want to make it for everyone over and over again. I’m already excited to make it for my parents. If you are vegetarian, you could try making this with tofu! I bet it would be pretty good. 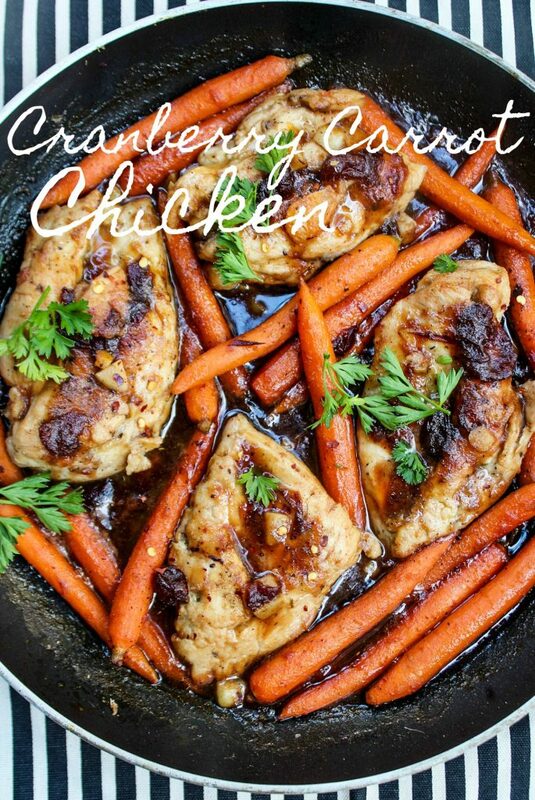 In a saucepan with cooking spray, add cranberry sauce, and carrots. Let the carrots cook in the cranberry sauce on medium heat. 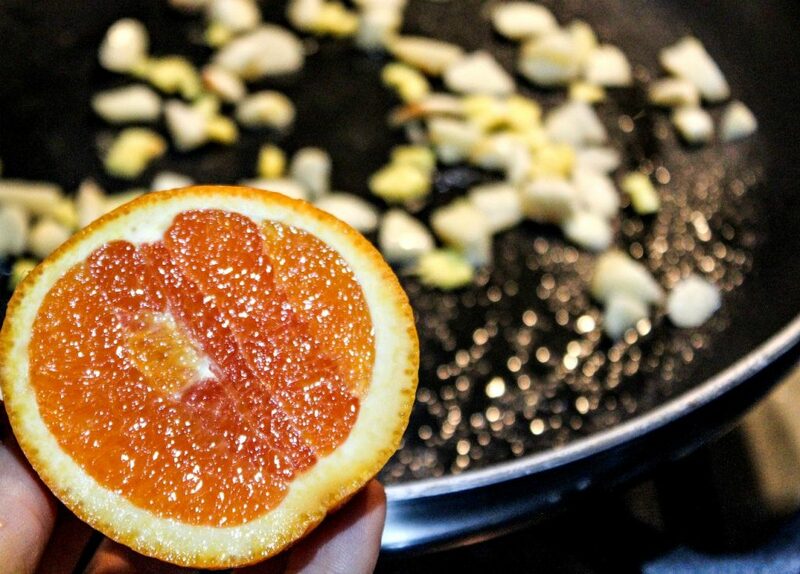 In a separate large saucepan, Add chopped garlic, ginger, olive oil, and the juice from the small orange. 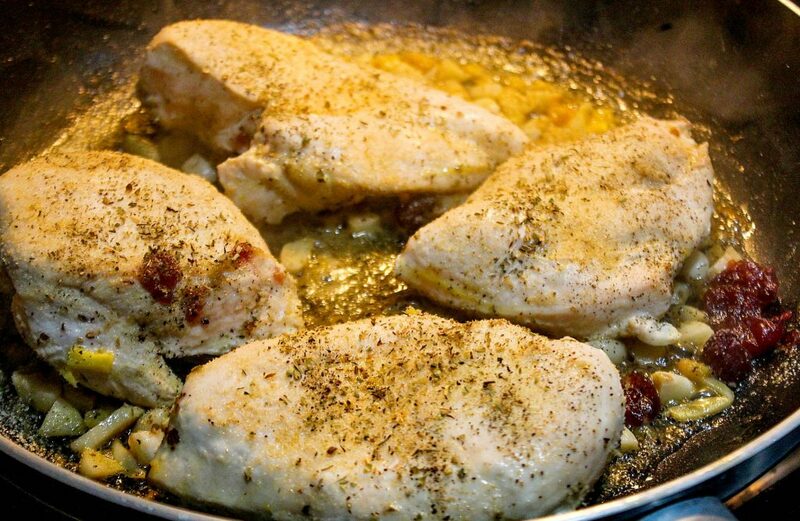 Once the pan is hot on medium-high, add the chicken breast. 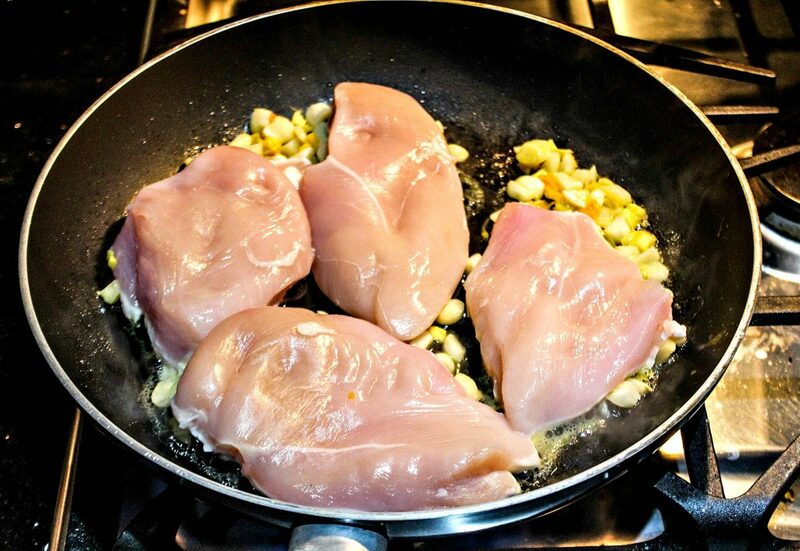 Add 1/3 Cup of water into the pan with the chicken. Cook on each side for about ten minutes. Add the black pepper, dill weed, pepper flakes, garlic powder, and onion powder. 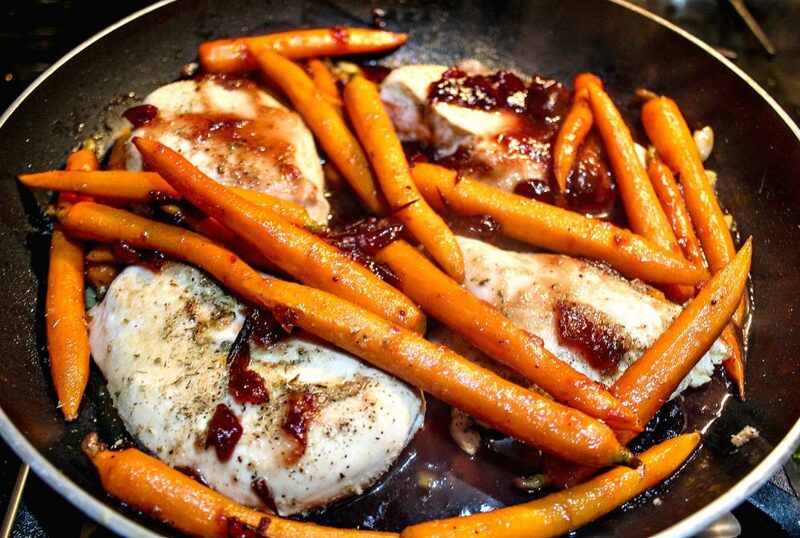 When the carrots are slightly soft, pour the cranberry mixture into the pan with the chicken. **You'll notice that the chicken has absorbed the water at this point. ** Add the 1/4 cup of water to the cranberry saucepan to collect any leftover juices. Add in the soy sauce. Flip the chicken twice. Turn the heat to medium and let the chicken slow cook in the juices. Once the chicken is done, turn the heat off and allow the sauce to slowly glaze the chicken as it cools. Top with parsley and serve! You can also add chopped pecans on top, too. 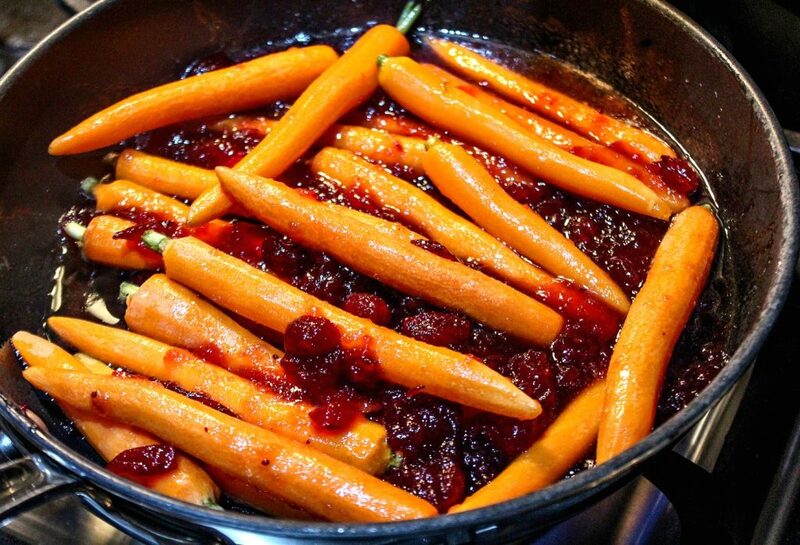 Glazing the carrots with the cranberry sauce will make your entire house smell like sweet fall baking. It was so hard not to steal some of the glazed carrots and eat them. It also doesn’t matter what kind of carrots you use. You can use baby carrots, diced carrots, or any fresh shaped carrots you find. Just don’t use the pre-cooked frozen carrots or canned carrots. Using canned cranberry made it easier, but if you want to make your own cranberry sauce, you can do that as well. Three flavors that were meant to be together; ginger, garlic, and orange. 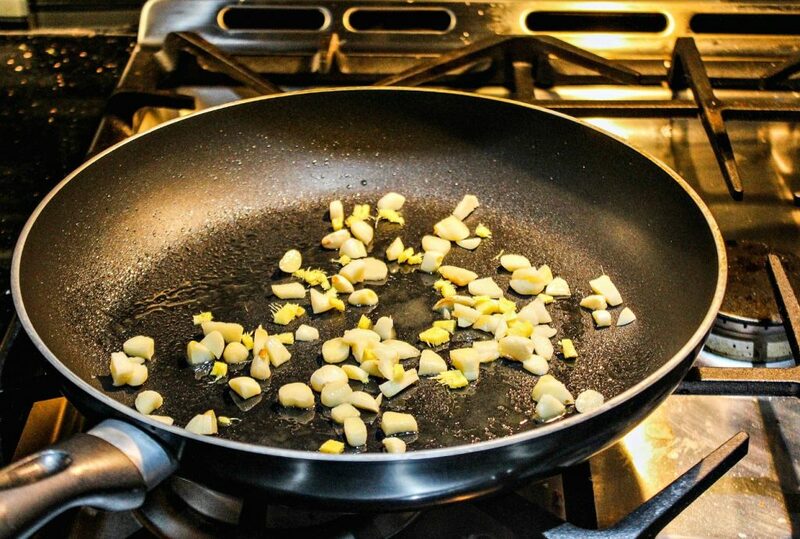 Add about one tablespoon of olive oil to the bottom of a large cooking pan. 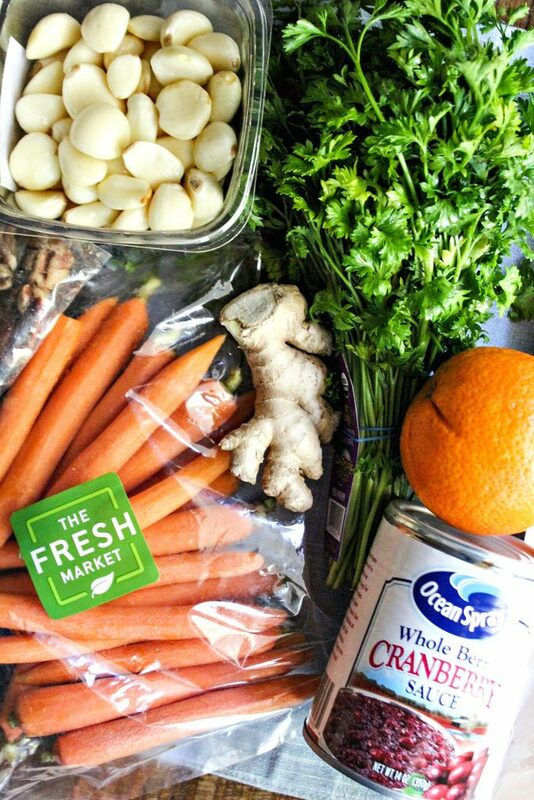 Add garlic, ginger, and the juice of one small orange. 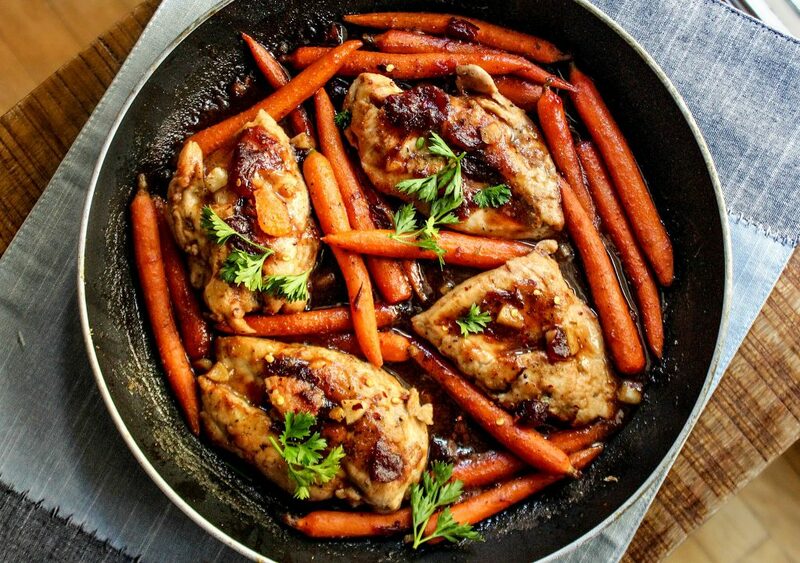 When the pan is hot enough, add the chicken. Add 1/3 cup of water to the pan. 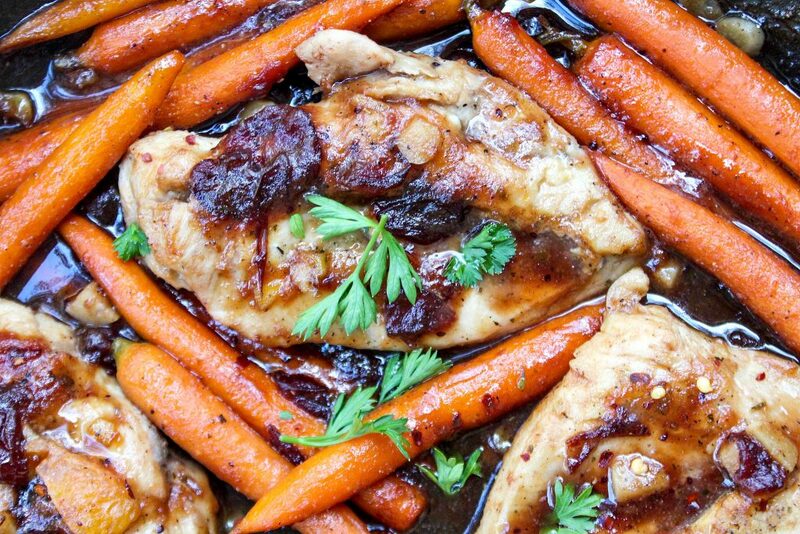 This will help the chicken cook through, and it keeps it nice and moist. No one likes dry chicken! Flip the chicken over, season it with dill, red pepper flakes, garlic powder, onion powder, black pepper, and let it cook five more minutes. 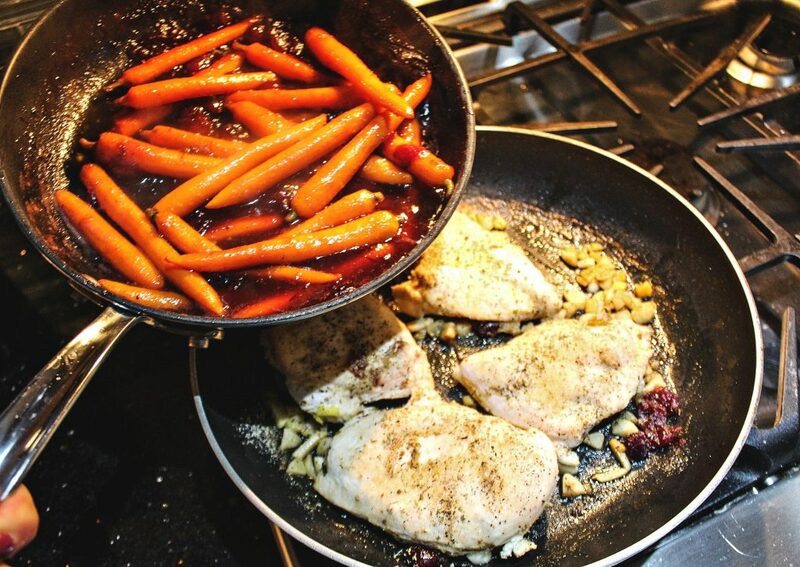 Once the carrots are slightly softened, pour the cranberry and carrot glaze into the pan with the chicken. Add 1/4 cup water to the cranberry pan to collect any leftover cranberry sauce. Pour that into the pan as well and add soy sauce. 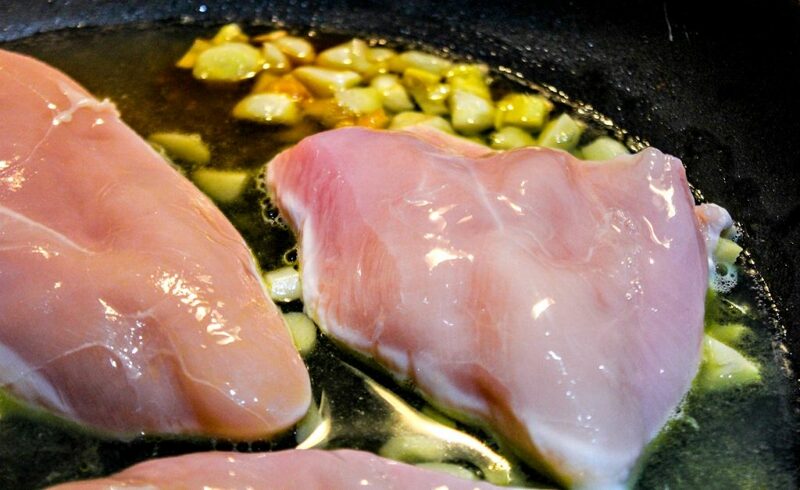 Turn the chicken to medium heat and cook for an additional fifteen minutes, and continue to flip a couple of times. It’s better to let the chicken slow-cook on a low/medium heat. That keeps the chicken from drying out. Top with parsley and serve! Make sure to use a thermometer to determine if the chicken is fully cooked. 165 degrees is the proper temperature. I promise this recipe tastes just as good as it looks, if not better. 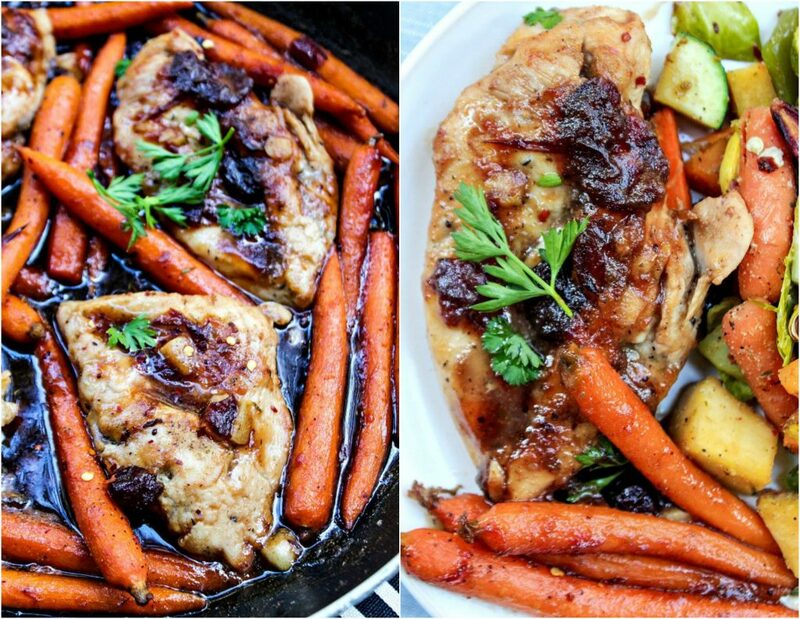 You could even make a version of this recipe with your leftover turkey from Thanksgiving. 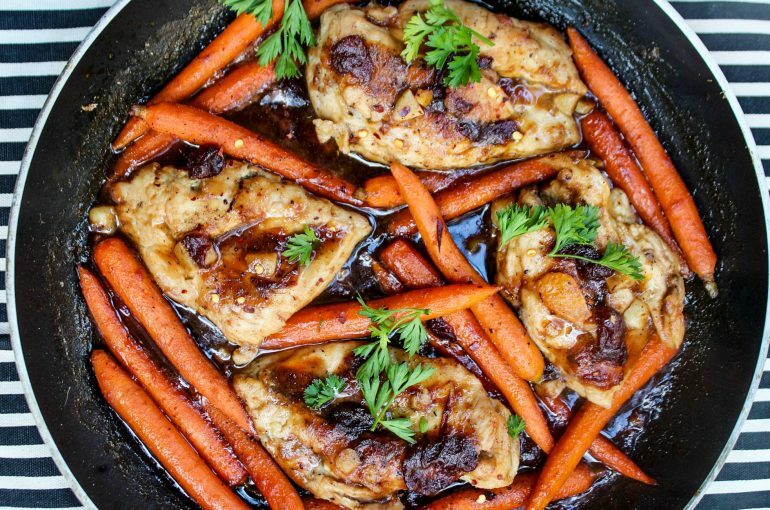 Now that I’ve learned how easy and flavorful chicken breast slow-cooked on the stovetop can be, I’ll be making a ton of recipes similar to this, with fun and unique flavors, of course. This dish only took about an hour to make, and it’s the perfect way to end a day. Nothing better than healthy comfort food, especially when it tastes this good. 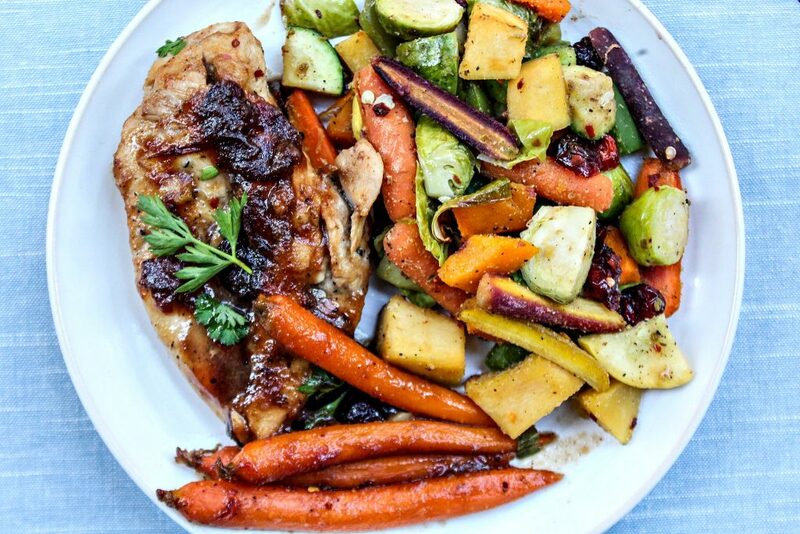 If you don’t like vegetables, or feel like making roasted vegetables the chicken would pair perfectly on a bed of rice. The sauce and the rice would taste so good together. What is your favorite healthy comfort food? Do you enjoy creating new recipes at home? Or trying new recipes at restaurants? Thanks for posting, I’m trying this tonight 🙂 Do you think it’ll still work with sweet potato instead of butternut squash? Thanks! 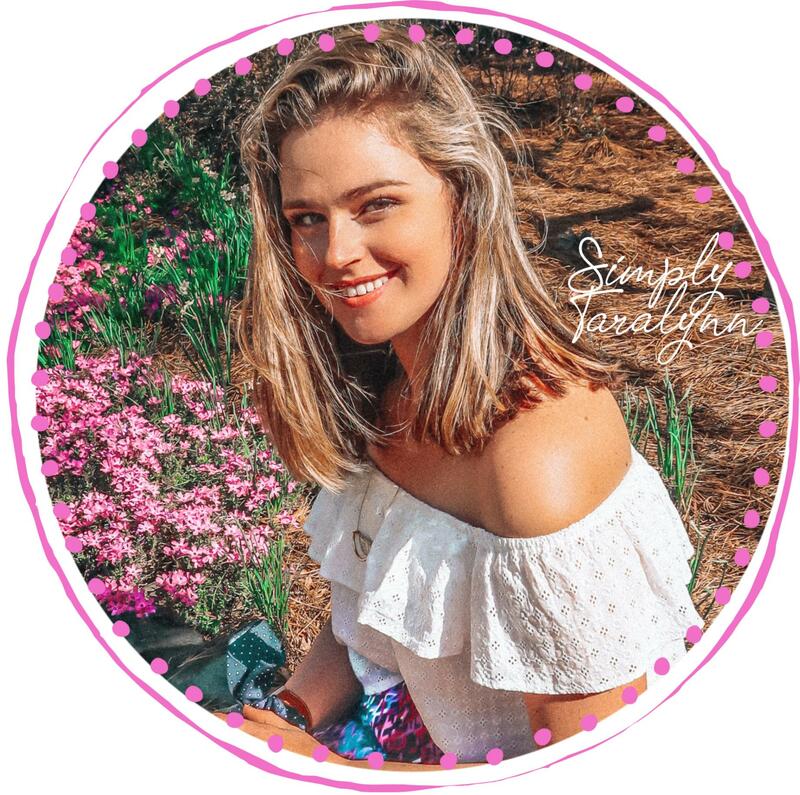 Hi Taralynn! I am responsible for the vegetable side dish at this years thanksgiving 🙂 Do you prefer this recipe or the other vegetable side dish you made and your friends-giving where you fried the garlic first in olive oil? I too enjoy LOTS of flavor. Yes!!! I mean, they are all good, but this is definitely a Thanksgiving treat!! I would definitely make this for thanksgiving!! Omg…we are eating this now. Goodness gracious it’s soooooo gooood!!!! Yay!! Glad you love it!!! Your recipes are always gorgeous and do-able! what a wonderful recipe it was delicious. Thank you. Oh this was such a mistake to check your blog before eating anything 😀 This looks fantastic!!!! Absolutely love it! This looks like something out of Martha Stewart Living. Fantastic job! I made this last night! My boyfriend and I loved it! I want to make this recipe with salmon. Think that would work? You’d definitely have to make some changes to the cooking but sure!! That would be so yummy. I would really like to try this recipe, but i’ve recently become vegan. I’ve never cooked tofu before, but i like the suggestion. Could you send me how what type to buy and some guidelines on cooking it for this recipe? I would really appreciate it! 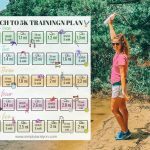 I will try to do this vegan version and post it!! This looks so amazing!! I can’t wait to make it this week! My favorite healthy comfort food is homemade Chili – only I substitute ground venison (super lean). Thank you! & oooooh yes chili! I love when you do recipes! I will definitely be recreating this, I LOVE cranberries! I love tossing dried ones into my wraps with turkey, brie and spinach and toasting it a bit. I would have to say my favorite healthy comfort food has to be soups. I love recreating things I’ve had while out, or when I stumble across things online. Just today I made oatmeal chocolate chip cookies and tossed in two cups of shredded zucchini I had leftover and they’re delicious! Can’t wait to see your pictures from the hike, it looks like you guys are really getting fall colors down there! I’ve been trying to do a lot more lately! MMM cranberries in almost everything is fine by me! Yes! Soups always, especially in the cold!! Great idea!! Zucchini in cookies? I may have to try that!! Omg…the hike was wonderful!!! 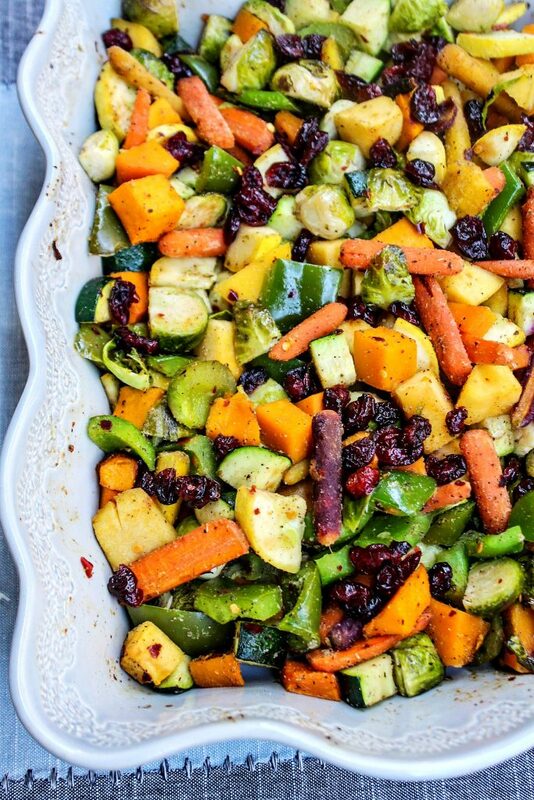 Roasted veggies and cranberries are such a perfect pairing! 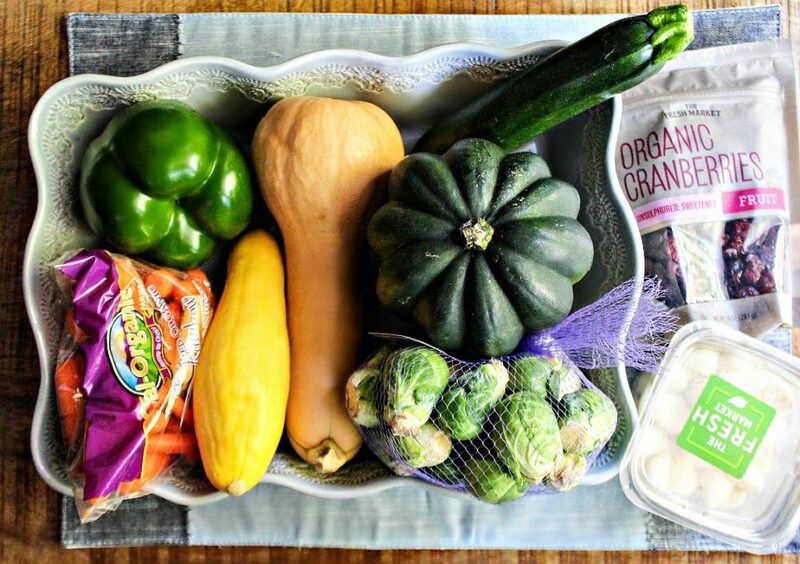 This is such an easy and yummy way to get a bunch of veggies into a meal. I LOVE cranberries. Every Thanksgiving since I can remember, they’ve been my dad’s dish to make. He makes them the same every single year, and it’s such a nostalgic taste for me. Makes me so happy! We love experimenting in the kitchen. It’s so satisfying to create your own recipes! I love when I make something new and Ben is all about it. I honestly believe in love through cooking! Is it very difficult to cube up the acorn and butternut squash when they’re raw? I’ve only ever made stuffed squash with them because I worried it’d be too hard to dice up. Nope! It takes a bit of time, but not too hard! Just make sure your knife is sharp. If you want to make it easier, you can soften it in the oven or microwave for a bit and then cut into it once it cools. You were right! I made this this weekend, and the squash was very similar to apples or potatoes. I guess I figured it would be difficult because spaghetti squash is always so difficult for me to cut! Beautiful! Roasted vegetables is a weekly staple of mine. I love making huge batches to eat through out the week 🙂 My favorite are roasted carrots. So delicious. I have never even heard of orageghetti. I’m excited for you to try it and let us know how it is! It was just like spaghetti squash but darker! Nay for cranberries! They give me energy crashes. Do you prefer cranberries or raisins? I will be making this for sure! This is the kind of stuff I love to make for comfort food! LOVE cranberries…on anything! Just one question? How can your digestive system handle so much garlic?! LOL!! 😁 You always have such beautiful photos for everything! What type of camera do you use? Lol I was born with a digestive system made for garlic!!!! 😀 Sometimes my phone and sometimes my cannon! OMG this looks AMAZING!!! I used to HATE cranberries as well but the older I got the more I liked them! Thanks so much for sharing. My husband will love it I am sure too! Awwww yaya!! Let me know what you think of it! Ah, this is exactly like what I would make. 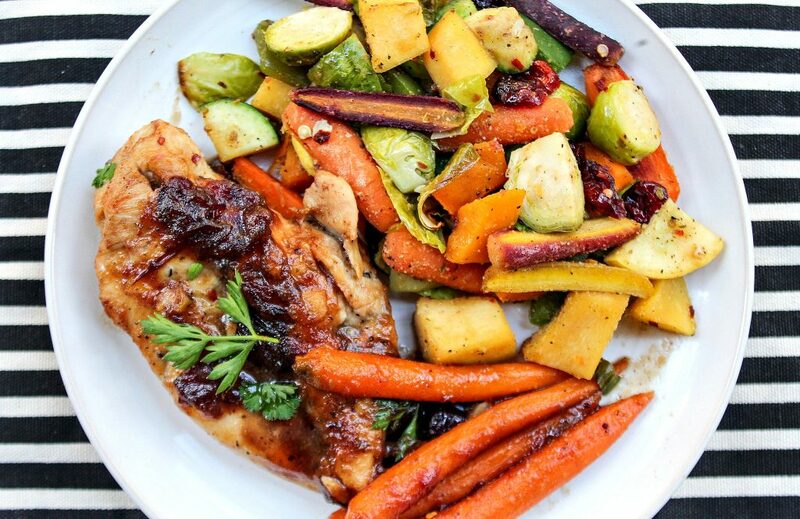 I love roasted veggies with chicken – and cranberries, mmm! yay!!!! I love to cook a big batch with a little Stevia to put on yogurt with granola. One of my favorite things to do is read restaurant menus (I love that you can find menus online to read)and come up with my own versions of what I read. I like eating out less and less these days, for both calories and expense, all I can think of when I do indulge is how much groceries I could have gotten! It has to be really worth it and something I can’t pull off at home, like sushi. Thank you for this recipe, it looks so amazing! I cant wait to try it!! Also I really love your photos, they are always so colourful and well arranged! For example these photos could be seen in a cookbook or a magazine! Love them! You had me at slowcooker! Please let us know how it turns out if you do try cooking it in there. It looks amazing as is!